Have you ever found yourself in a situation where you need some help? If you have been fortunate enough to never have a scenario like this befall you, maybe you know someone who has. Life is unpredictable which can lead to very pleasant serendipitous moments that we cherish in memory, yet it can also lead to short-term difficult crunches. These crunches can be financial, physical, or even emotional and they can take a serious toll on us by providing unwanted stress. The fact is that we never know when we may need a little help, a little relief and a solid dose of hope for the future. At Cashco Financial, we live by our organizational mission; to provide relief today and hope for tomorrow. We consistently try to help anyone we know who are in need of some help to get them back on track. It is said that if you put good energy out into the world, the world will become a better place to live, so we want to make sure we are doing our part. Respect the Vision: provide relief today and hope for tomorrow. Listen and understand client needs, find the best way to help, and then nurture the relationship until the client no longer needs our help. Live the Golden Rule: people don’t care how much you know until they know how much you care. Speak actions, model those actions, and reinforce them. Own the Results: take accountability for yourself and your work. Self-examine, learn, take action, recognize, own. Never blame, deny or ignore. 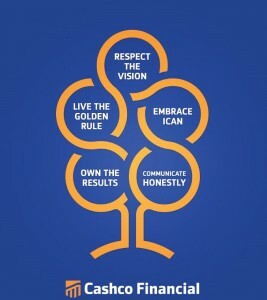 Embrace ICAN: constant and never-ending improvement because I can be 1% better every single day. 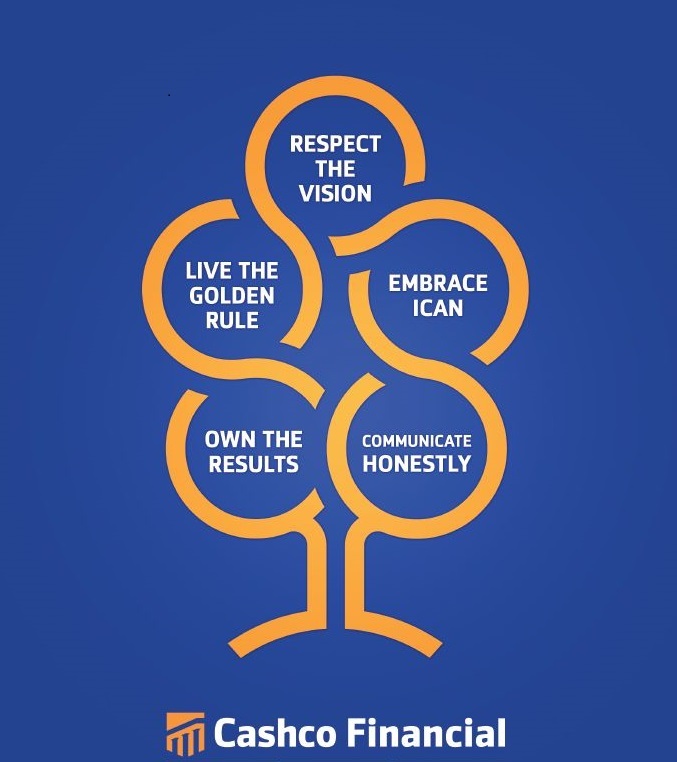 Communicate Honestly: face the conflict, speak the truth and stand together with candor and respect. Cashco Financial is always looking for new ways to lend some help to people in need. We believe in making the ordinary, remarkable. This is why we have implemented the Wish It Forward program where our staff and customers can nominate people in special circumstances, to receive an extraordinary experience. Sometimes it can be difficult to understand just how much of a positive impact one remarkable experience can have on a person. But if you think about it, that makes perfect sense. Try this: close your eyes and think back to a happy memory from at least ten years ago. Now come back to the present; are you smiling? Exactly, that experience from more than a decade ago, brought happiness to you today. We all have the ability to create a moment like that for someone else, so why not do it as often as we can? That is what Wish It Forward is all about. Over the years, we have purchased a three month supply of specialized formula for a newborn battling an infection. We bought and installed TVs and game systems for several households during the Christmas season. Gift cards for grocery stores are also always on hand for those in need. Whatever the initiative might be, we believe that each person has the power to make the world a better place, one random act of kindness at a time. We also proudly support the Zebra Child Protection Center, and the local Food Banks in all the communities we serve including Guelph, Ontario as well as many more charitable organizations. 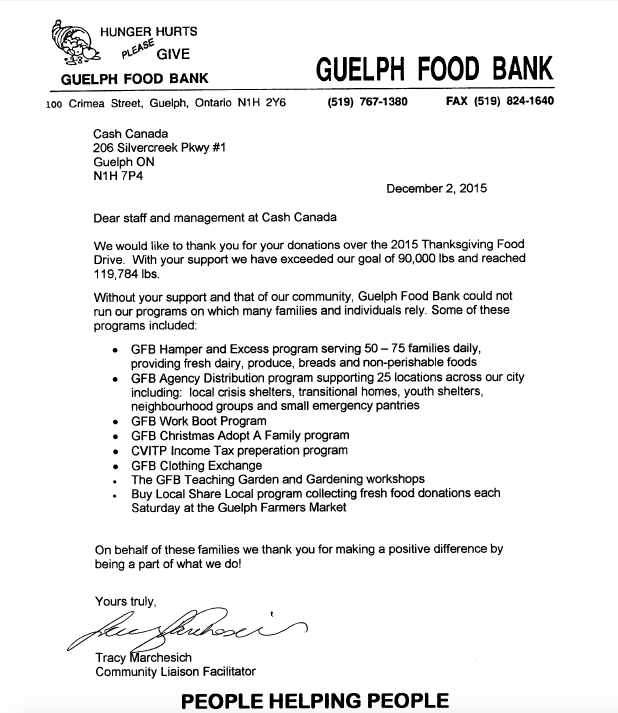 Hey thanks for the kind letter Guelph; we will continue doing whatever we can in the fight against hunger! As we said we are a proud supporter of Zebra Child Protection Center. One of the greatest injustices in the world today is the neglect or abuse of children on behalf of a parent or guardian. The Zebra Centre was the first of its kind in Canada and was founded on the belief that the community should share in the responsibility of responding to child abuse allegations. Zebra is a place where a child can feel safe and protected. The Centre works with a community of professionals, including the Edmonton Police Services, Royal Canadian Mounted Police, Alberta Children’s Services, Crown Prosecutors, Child at Risk Response Teams, medical and trauma screening professionals and volunteer advocates. Their team offers support and stability, so a child is around the same familiar, friendly faces every step of the way. Zebra also provides referrals to children with social, medical and mental health services, so that they have the support they need. We want to help them to grow into a national organization in the next five years. Due to higher demand in Alberta, we want to show our support to the local Food Banks in Edmonton, Red Deer and Calgary.